We came back from Kiev right when the fresh cherries started actively selling at our nearby market. 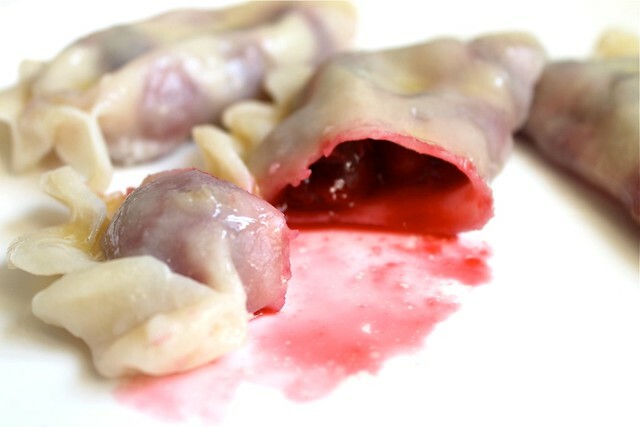 So we made our beloved vareniki with cherries, that we didn't do for many years. In the process the venture extended to also include cottage cheese vareniki. I'll never be able to tell which one of these two sweet vareniki versions is better. It is not like with savory vareniki, where mashed potato is my absolute first choice. 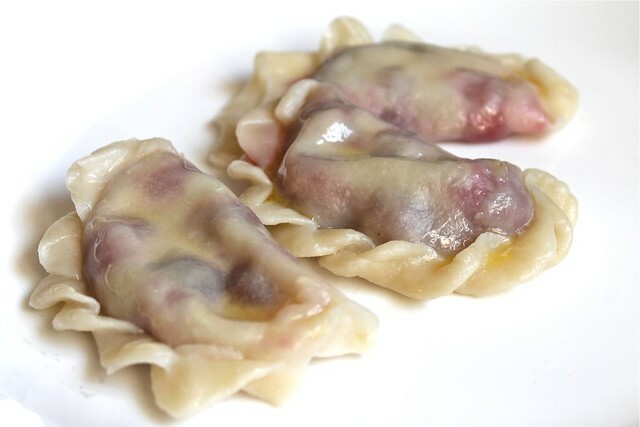 For me it was always somehow counterintuitive that a dumpling filled with cherries can taste so wonderful, but it does. You bite in through a thin and soft coating and intense red, sweet and sour juice runs into your mouth. It is very hard to tear yourself away from them! When the cherries are not in season, you definitely can use frozen cherries and get a good result. Cottage cheese vareniki are different. To me they fall into a large group of all time cottage cheese family delights (together with syrniki, lazy vareniki and Russian cottage cheese cake / zapekanka). Use the tastiest cottage cheese you can find. Otherwise use some unsalted or very lightly salted fresh cheese of your choice. The filling is sweetened and lightly salted and it works great with the melted butter and with sour cream, which serve as traditional complements. 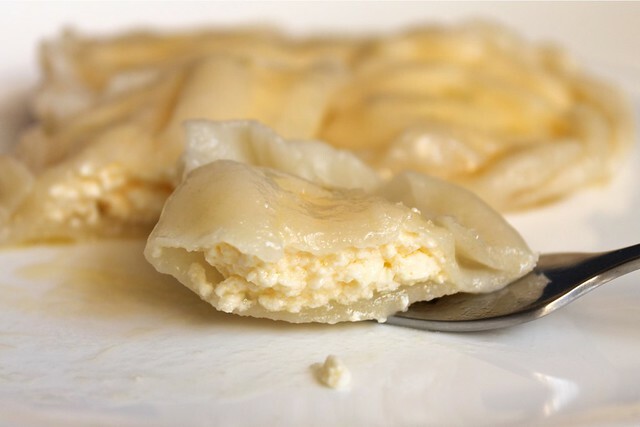 We always have vareniki (either savory or sweet) as a meal in itself. It is better to cook them right before serving. As you boil them in little batches, place each ready batch into a large bowl over the previous one, but don't forget to cover each layer with melted butter (otherwise the vareniki will stick to each other). Serve them warm with chilled sour cream (or unflavored yogurt) and fruit syrup or jam (optional) on the side. If something is leftover, reheat them in a frying pan with some butter. This gives the vareniki a complete new life. When you are making sweet vareniki it is still very important to add salt. Both the dough and the cooking water need to be salted. Otherwise you end up with tasteless and hardly edible vareniki. In our family we always make each varenik quite large. They are not bite size, but rather 2-3 bite size. This lets you use more filling and less dough overall, but this definitely a matter of preference. Here is how we make them. Prepare the vareniki dough as described below. Mix the cherries with flour and set aside. Do not mix the sugar in yet, this will force the juices out of the cherries. Using your hands form the dough into a long cilinder around 3 cm in diameter (it is easyer to separate the dough into 4 parts and repeat the process). Cut the cilinder into 3 cm chunks. Roll each chunk into a round, some 1-2 mm thick (you'll need to flour the table and roller, otherwise the pastry will stick). Put around 5 cherries on each round. Add a tea spoon of sugar on each round on top of the cherries. Slightly brush the sides of the round with water. Pull the sides together and seal them with your fingers to form a semicircle. You can well stop here and put the vareniki onto a floured surface to prevent them from sticking. Or you can try and make a special "lock". My grannie always did it, so do I. It will make them pretty and safe (in a sence that they won't open up while cooking in boiling water for sure). It is really easy. Start from one angle. Place your thumb under the the edge, wrap it up and press from the top. Then move up the enge and repeat till you reach the second angle. Fill a large pan with water and bring it to the boil. Add some salt (same amount as you add for cooking pasta). Add the vareniki 5-6 at at time. Cook on medium heat. Gently move them around to prevent from sticking to the bottom of the pan. After they come to the surface, cook for some 4 minutes and take out. As you boil them in little batches, place each ready batch into a large bowl over the previous one and cover each layer with melted butter (otherwise the vareniki will stick to each other). Serve them warm with chilled sour cream (or unflavored yogurt) and fruit syrup or jam (optional) on the side. 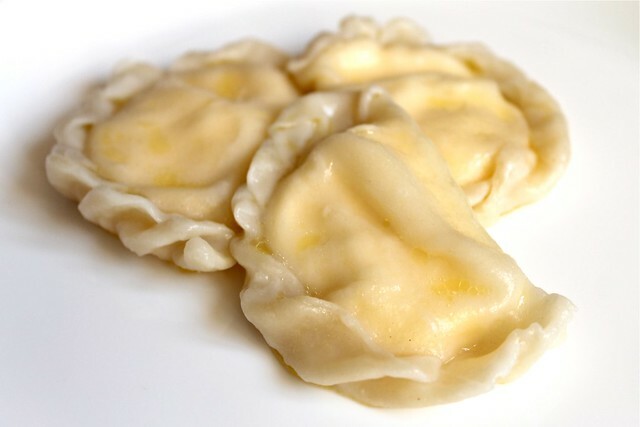 You can freeze vareniki before boiling. They will keep well in the freezer for weeks. You don't have to unfreeze them before boiling. Just give them additional 2 minutes of cooking. Mix the cottage cheese with an egg, sugar and salt. Using your hands form the dough into a long cilinder around 3 cm in diameter (it is easyer to separate the dough into 4 parts and repeat the process). Cut the cilinder into 3 cm chunks. Roll each chunk into a round, some 1-2 mm thick (you'll need to flour the table and roller, otherwise the pastry will stick). Put around 1.5 table spoons of cottage cheese filling on each round. Slightly brush the sides of the round with water. Seal, cook and serve the vareniki as described in the Vareniki with cherries recipe (from step 5 on). Place 120 g of flour and a tea spoon of salt in a large bowl. Pour in the water (it must be very hot, almost boiling) and rapidly stir together using a spatula till the mixture gets even. As the water is very hot the mixture will look lumpy at first. That's OK, if you stir it energetically it will come together nice and smooth. Keep adding flour till the dough is still soft but doesn't stick to your hands any more (you will need to start working it with your hands on a flat surface after some critical mass of flour). Make a ball, wrap it into a slightly wet kitchen towel and let rest for 10 min. Сто лет не ела вареники! Надо срочно исправлять ситуацию, тем что сейчас - действительно - сезон вишни! Спасибо за напоминание о столь любимом мною в детстве блюде! Смотрю фотографии - и аж слюнки текут! Спасибо! Вкуснейших Вам вареников! :) Очень рада познакомиться с Вашим блогом! Спасибо! :) Можно и здесь и в ЖЖ оставлять, как Вам удобнее!